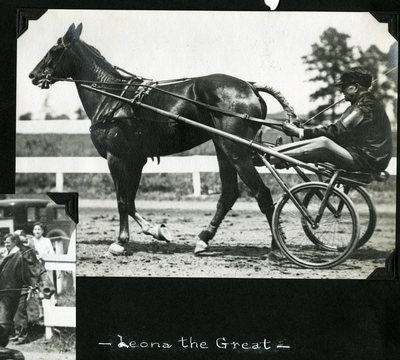 Two overlapping photos of Leona the Great. The primary photo in this image shows Leona the Great as a three-year-old cooling down in the back stretch at Sage Park, Windsor, Connecticut in the Bay State Circuit on Wednesday, July 2, 1930. The driver is W. Crozier.